The Economic Policy Institute (EPI) organized for a thirteenth consecutive year its traditional Summer Seminar for Young Public Servants from South Eastern Europe (SEE) and the Black Sea region. 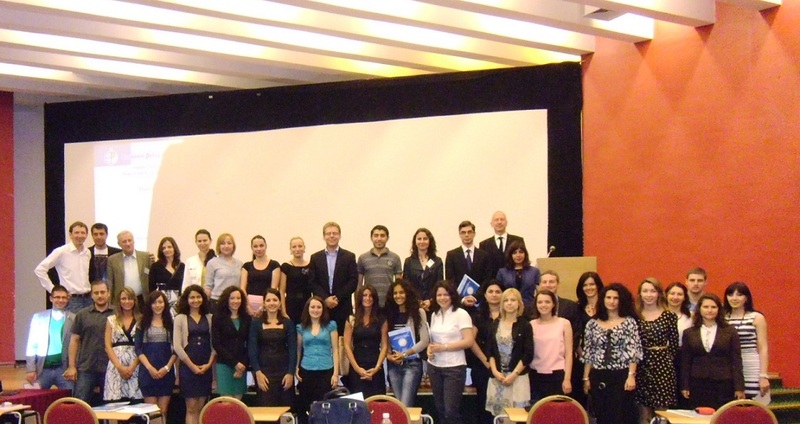 This year’s seminar was held in the period June 4-9, 2012 under the auspices of the Ministry of Foreign Affairs of the Republic of Bulgaria and with the kind financial support of the Hanns Seidel Stiftung, the Black Sea Trust for Regional Cooperation and the Representation of the European Commission in Bulgaria. The 2012 Summer Seminar was hosted by the Albena resort located on the Bulgarian Black Sea coast and gathered a diverse group of 34 promising young state experts from thirteen SEE and Black Sea countries selected after a competitive application procedure. Together with distinguished international experts, ambassadors, practitioners and academics they had the chance to elaborate on a wide range of topics covering both broader strategic themes in the field of European politics and economy and specific issues of regional significance. In this, regard, the five-day long seminar focused on the following thematic fields: current developments in Europe and the way out of the Euro crisis; political and economic challenges before the SEE and Black Sea Countries; transformation of the public administration; impact of the new member states on the EU policies and processes; EU budget and EU structural assistance to the new member states; future of the EU integration process, medium and long-term perspectives for Europe. ● Kristina Hitrova, State Expert, Directorate for Coordination of EU Affairs, Council of Ministers, Sofia. Besides the common panel sessions, based on the positive experience from the previous editions of the seminar, the program consisted also of the World Café interactive workshop. This time the young experts were challenged to focus their attention on their “Vision for the Future of Europe”. This provocative task led to active discussions and deliberations in the five working groups and respectively to fruitful results at the end. In addition to all the sessions mentioned above, a practice-oriented approach was included into the program as well – a one-day study visit to the towns of Ruse and Giurgiu located on both sides of the Danube in Bulgaria and Romania. The main goal of this trip was to present concrete examples of successfully implemented and well-functioning cross-border cooperation projects. Thus, during the study visit, held on June 6th, the participating young civil servants had the opportunity to get acquainted with specific models of cross-border cooperation between Bulgaria and Romania, by exploring the regional cooperation projects between Ruse and Giurgiu. Thus, the Summer Seminar for Young Public Servants from South Eastern Europe and the Black Sea region proved for a thirteenth time that it is a fruitful initiative, leading to a successful exchange of know-how among the young public servants from the state administrations of the targeted fifteen SEE and Black Sea countries. Through providing a forum for active discussions and deliberations on actual topics, the seminar directly contributed to increasing the knowledge and improving the understanding of the public officials on the current processes observed in Europe, as well as in all targeted countries. The long-term initiative not only contributed to the co-operation and mutual learning among the public administration structures of the targeted countries, but it also encouraged the establishment of regular networking and permanent contacts between the SEE and Black Sea young experts and high-level experts from EU institutions, member countries’ decision-makers, think-tanks, etc. Therefore, it is beyond any doubt that the Summer seminar is an excellent instrument for exchange of experience, know-how, ideas and best practices, which is of great importance for increasing the administrative and professional capacity of the young experts and for better preparing them for the future challenges and problems in their every-day work.